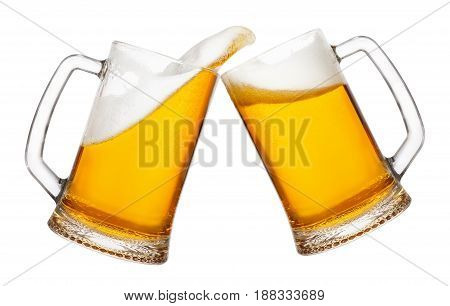 mug › Buy Poster of cheers, two mugs of beer toasting creating splash isolated on white background. Pair of beer mugs making toast. Beer up. Golden beer splash. Poster of cheers, two mugs of beer toasting creating splash isolated on white background. Pair of beer mugs making toast. Beer up. Golden beer splash.